Who can resist the allure of blue for a baby boy? We say, go with what you love. While blue is calming and tranquil, it's also sporty, crisp and fun. Choose the shade that speaks to you. 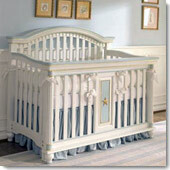 We have baby cribs in ocean blue, sky blue and navy. With a whole palette of choices it's easy to find the boyish crib you love.